three ku – none of ’em winter! Here in the frosty grip of winter I’m missing summer – so I’m re-posting this today! A whole post on ice cream? Yep. 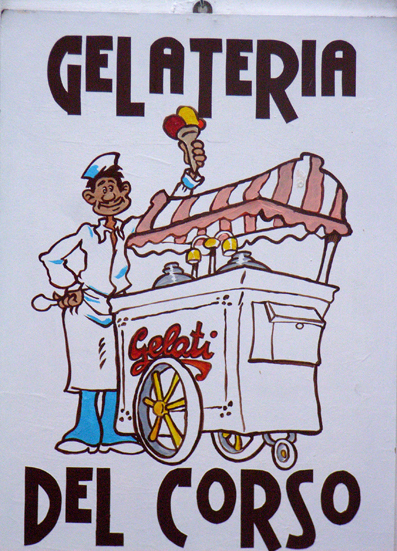 You cannot travel to Italy and not sample – extensively – the gelati. We probably tried around twenty flavours in three weeks and now that it’s so long ago I can’t recall them all, but I do remember a few. Vividly. The ‘panna cotta’ for instance, was earth-shakingly good, while classic flavours like fragola (strawberry) and cioccolato were also fantastic. Probably the hardest thing was knowing when to stop actually. All worth it though. The sign below we found in the middle of Amalfi, up beyond the Piazza Duomo and had to find a new SD card in order to photograph it, as by then (our second city into the trip) we’d already gone through a few gig.